Better Buy: Starbucks Corporation vs. PepsiCo, Inc.
Pepsi is much more than just its namesake Cola. But is that enough to edge out Starbucks? You don't have to be an investor to know what Starbucks (NASDAQ:SBUX) and Pepsi (NASDAQ:PEP) are all about. That type of brand awareness helps explain why shares of both companies have whipped the market since the turn of the millennium. 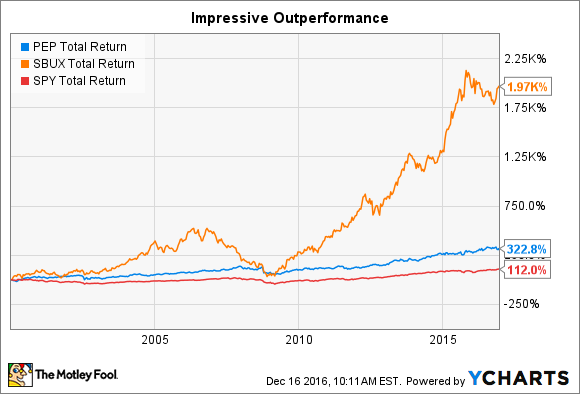 While Pepsi's tripling of the market over that time frame is nothing to take for granted, Starbucks' performance has been even more impressive, providing an almost 20-fold return from an early 2000 investment! But does that make the stock a better buy today? Not necessarily -- the market is a forward-looking entity. While we can't answer with 100% clarity which is the better stock to buy moving forward (my crystal ball is currently on the fritz), there are a number of different approaches to the question that can give us a better idea for which is the better deal. Money sitting in a bank account is pretty boring. Investors usually want to know that either excess cash is being reinvested in growth opportunities, or being returned to shareholders. But that's a myopic view. When a company has ample cash on hand, it has options in times of crisis -- and times of crisis will happen with every one of the companies you own at some point. Whether macro or company-specific in nature, when a company has cash, it can not only endure tough times, it can become stronger as a result, by outspending rivals, buying back shares, or even making opportunistic acquisitions. But when a company is laden with debt, the opposite is true: These companies have to narrow their focus and solely devote time to making ends meet in order to avoid bankruptcy. Here's how Starbucks and Pepsi stack up in terms of financial fortitude. Data source: Yahoo! Finance. Net income and free cash flow on trailing-12-month basis. Both of these companies are in relatively stable positions. They have very manageable debt loads and produce tons of free cash flow that help give them more than enough wiggle room. If forced to choose, though, I would have to give the nod here to Starbucks. With slightly more cash on hand than debt, I think it would have more options should something unexpected occur with the business or the larger economy. Pepsi, while not being irresponsible with its debt load, might have a tougher time. Commonly referred to as a "moat," there's no variable that's been more consequential to my investments than the sustainable competitive advantages of the underlying companies I've put my money behind. Broken down to its simplest form, a moat is the secret sauce that separates a company from its competition. Both of these companies rely principally on the power of their relative brands to give them a competitive edge. Starbucks not only has thousands of locations worldwide, but it also has its coffee available in grocery stores and even ice-cream aisles. Pepsi, on the other hand, is more than just its namesake cola. The company also owns several other beverages (Gatorade, Tropicana, 7-Up, to name a few), and a number of food brands (Quaker Oats, Lay's, Fritos, Doritos). While I believe Starbucks probably has an advantage over the long run since coffee hasn't been shown to be anywhere near as toxic for the body than soda or processed foods, the bottom line is that these two are built on the strength of their brands, and there's nothing making one substantially more powerful than the other. At first blush, it might appear that Pepsi is the runaway winner, here. It's cheaper on both a price-to-earnings, and price-to-free-cash-flow basis. It also has a bigger dividend yield. But then there's the PEG ratio, which attempts to measure how expensive a stock is relative to its growth rates. In theory, a PEG ratio of 1 means a stock is "fairly valued." On this metric, Starbucks trades at a 40% discount to Pepsi. This is likely because the company has a massive opportunity it's pursuing in both China and India, and its forays into food could produce outsized returns as well. Taking all of that into consideration, I would say this one is a tie as well. So, there you have it, Starbucks comes out ahead, based primarily on its stronger balance sheet, but buoyed by the fact that its valuation -- relative to the growth potential in Asia -- seems not quite as expensive as one might think.